With the acknowledgment and acceptance of the facts also comes a degree of freedom from them. For example, when you know there is disharmony and you hold that "knowing," through your knowing a new factor has come in, and the disharmony cannot remain unchanged. When you know you are not at peace, your knowing creates a still space that surrounds your nonpeace in a loving and tender embrace and then transmutes your nonpeace into peace. As far as inner transformation is concerned, there is nothing you can do about it. You cannot transform yourself, and you certainly cannot transform your partner or anybody else. All you can do is create a space for transformation to happen, for grace and love to enter. So whenever your relationship is not working, whenever it brings out the "madness" in you and in your partner, be glad. What was unconscious is being brought up to the light. It is an opportunity for salvation. Every moment, hold the knowing of that moment, particularly of your inner state. If there is anger, know that there is anger. If there is jealousy, defensiveness, the urge to argue, the need to be right, an inner child demanding love and attention, or emotional pain of any kind — whatever it is, know the reality of that moment and hold the knowing. The relationship then becomes your sadhana, your spiritual practice. If you observe unconscious behavior in your partner, hold it in the loving embrace of your knowing so that you won't react. Unconsciousness and knowing cannot coexist for long — even if the knowing is only in the other person and not in the one who is acting out the unconsciousness. The energy form that lies behind hostility and attack finds the presence of love absolutely intolerable. If you react at all to your partner's unconsciousness, you become unconscious yourself. But if you then remember to know your reaction, nothing is lost. Humanity is under great pressure to evolve because it is our only chance of survival as a race. This will affect every aspect of your life and close relationships in particular. Never before have relationships been as problematic and conflict ridden as they are now. As you may have noticed, they are not here to make you happy or fulfilled. If you continue to pursue the goal of salvation through a relationship, you will be disillusioned again and again. But if you accept that the relationship is here to make you conscious instead of happy, then the relationship will offer you salvation, and you will be aligning yourself with the higher consciousness that wants to be born into this world. Excerpted from The Power of Now by Eckhart Tolle. Seed questions for reflection: How do you relate to the notion that relationships are here to make us conscious? Can you share a personal story where unconscious behavior was held in the loving embrace of knowing, without reacting? What practice helps you to remember your reactions and grow in awareness? DO YOU NEED %100 LEGIT LOAN ? CHEVRON FINANCE FIRM is a branch of CHEVRON COMPANY that offer loans to individual and public sector that are in need of financial Assistance in a low interest rate of 2%. Bad credit acceptable, The Terms and Conditions are very simple and considerate. You will never regret anything in this loan transaction because we will make you smile. Our company has recorded a lot of breakthroughs in the provision of first class financial services to our clients, especially in the area of Loan syndication and capital provision for individuals and companies. We have brought ailing industries back to life and we back good business ideas by providing funds for their upstart. We have a network of Investors that are willing to provide funds of whatever amount to individuals and organizations to start business and operations. I want you to understand the fact that CHEVRON FINANCE FIRM is out to help the less financial privilege get back on track by providing all type of ... [View Full Comment] DO YOU NEED %100 LEGIT LOAN ? After many, many years of playing the victim, I’m now awake and I know that I’m in an unhealthy relationship. I feel deep love for my husband. I pray that he will know peace and happiness; however, nearly every utterance from under his breath is a curse or insult or complaint. I am trying to stay calm despite this, but see it’s effects on our sons. I’m struggling with knowing what to do. he is also specialize in restoring barrenness and you will conceive. he can also help you if you have problem in your work place. card. get yours from her. Just send her an email on kevin_norris899@hotmail.com. Just few weeks ago I saw a comment about Dr. Aluya Solution Temple, someone talking about how he has help him in his relationship break up, I also contacted him because i was facing the same problem in my relationship, today i can boldly recommend Dr. Aluya Solution Temple to someone who is also facing break up in his or her relationship to contact him for help today because he has help me restore my relationship back to normal, here is he contact details (dr.aluyasolutiontemple@yahoo.com or whatsapp him on +2347064851317 you can also visit is website aluyasolutiontemple.webs.com for help,thank you sir God bless you. Am Kumar Reyer from Scotland. I was having serious relationship problems with my boyfriend and it had resulted in him moving out to his friend’s apartment. Everything got worse because he started going to bars and strip clubs frequently with his friend, getting drunk and passing out. He always threatens me on phone whenever I call him because of all the bad advises that his friend has given him. I really love him and we had been dating for 8 years which gave us a beautiful daughter. I had also lost a lot of money on therapists until I was introduced to Dr. Ade by a friend whom he helped to marry her childhood boyfriend; this gave me total confidence and strength to get him back. I did all he asked and after 48 hours my boyfriend called me and rushed back home, things just changed between us emotionally. He has a job and stopped drinking and keeping irrelevant friends. It’s a miracle I never believed was possible because I had lost all hope until I found Dr.Ade. So that’s why I promised to share my testimony all over the universe. All thanks goes to Dr.Ade for the excessive work that he has done for me. Below is the email address in situation you are undergoing a heart break, and I assure you that as he has done mine for me, he will definitely help you too. Adespelltemple@ gmail. com or call he on +2348148487280. Get BLANK ATM Programmed Card and cash money directly in any ATM Machine around you. There is no risk of being caught, because the card has been programmed in such a way that it's not traceable, it also has a technique that makes it impossible for the CCTV to detect you and you can only withdraw a total amount of $5,000.00 USD in a day. Now email us today at our E-mail address at: Atmcardcashmachine@hotmail.com and get your card today and live that luxury life you every dream to live. HOW LLOYDS BANK GRANTED ME AN XMAS LOAN!!! Cure diseases like; chest pain, loss of appetite, allergies, short breath, stomach pains, high blood pressure, acne, skin diseases of any kind, back pains, snake bites, high fever, and mental disorders. Mi novio era muy tranquilo y parecía enfadado hacia mí cuando regresó de la oficina Parecía mal humor y no se preocupan por la cena, incluso canceló nuestros planes debido a la enorme presión de los miembros de su familia. Después de tomar alguna engañosa asesora de algunos de los miembros de su familia. Hemos estado saliendo durante más de 3 años y la planificación de nuestro futuro juntos. Dijo que es más, cuando le pregunté qué le pasaba, estaba muy enfadado y me quería fuera de su vista. Un buen amigo mío que sabe acerca de nuestro separamos presentarme a una máquina de colada amor hechizo que le ayudó con un hechizo que trajo de vuelta a su novia. Pensé que la idea de un hechizo de amor era extraño, pero estaba dispuesto a darle una oportunidad. Cuando entré en contacto con el Dr. Ezomo por primera vez que estaba asustado, pero él me aseguró que sólo usa la magia blanca que es seguro y no tiene efectos secundarios. Me sentí un poco mejor y decidí hacer el hechizo amante de retorno. Dentro de 4 días después de que el hechizo se lanza se presentó en mi oficina, dijo que me echaba de menos y quiere que estemos juntos de nuevo. Estoy muy feliz y quiero decir un gran agradecimiento a la Dra Ezomo por su trabajo maravilloso Estamos de nuevo juntos y nuestra relación ha sido mejor la segunda vez. Puede ponerse en contacto a través de su dirección de correo electrónico: drezomospellhome@hotmail.com o ponerse en contacto con él a través de WhatsApp 2349055406117 o ponerse en contacto conmigo; edwardkimberly24@gmail.com para obtener más información sobre Ezomo dr,. Tolle explanation are easy to understand. Relationship is the only thing that keeps you live. Life is full of problems, full of miseries, failures and dissatisfaction. There are times when you find your self so lonely that nothing can take you out other than a sweet relation. The only this that matters in life for which you do every thing is your relationship. You create an empire of leave the world for eternity it is only for the sake of relationship. There is nothing more charming, soothing beautiful, fragrant than a relationship. This has so resonated with me. I figured out early in my marriage that it is not my job to make my husband happy -- that's his job. After a few years, I realized that it was also not his job to make me happy, that's MY job. I have grown so much in our relationship, not because he makes me happy, but because he can stoke every unconscious and unresolved issue in every dark corner of my being. Today, I am grateful and in love with my husband for helping with my growth which has released me to deeper connect with spirit, love of self and others and a rich life. The journey was not easy as I had to grieve the relationship I thought I wanted with him and trust that something better was ahead. My partner and I have been listening to Eckhart every night before going to bed. Overy time, some of his wisdom has seeped into our subsconsciousness and has brought some presence, spaciousness and acceptance in life and in our relationships. The true gem for me from Master Eckhart is his teaching which I have found to be so true- the fact that "relationships are there to make you CONSCIOUS not necesarrily HAPPY".Happiness is what lies within us. As soon as I have realized this and striven to practice that, I noticed that peace is the immediate outcome. Making "space" around unhappiness brings acceptance and hence peace. Even if it means that the relationship no longer serves you and you may have to let go- its ok. I don't believe that our job is to make every relationship "right" but to make it right for each of us. I am learning how relatioships serve as mirrors into our selves (esp. the difficult ones) to that which needs attention, to realize and heal, with kindness and compassion towards ourselves and our partners in relationships. When love is less, challenges are more. It takes a momentary thought to create an issue but a lifetime to overcome. We are using more head (logic), which creates difficulty to love or surrender. Acceptance becomes automatic and differences non-existent, in moments when there is pure love. 'Bhakti' seems to be the most beautiful practice of divine love, one can experience & offer. I appreciate the gentle wisdom of this article. I believe that we do wake up, become more conscious, through relationship, which results in happiness from within. We are related, and in relationship we have the ongoing opportunity to transform. I used to be more angry, negative, defensive, critical than I am now, and my being in relationship with my wife who is positive, accepting, patient, encouraging has very much helped me become more aware of how I was and become more soft, less angry, more positive, and more kind. I was held in loving embrace, and my becoming more conscious and growing occurred and is occurring over many years -- I'm a slow learner. Knowing what happens for me, remembering that I can learn and change, helps me to grow in awareness and helps me to be more compassionate toward myself, and knowing that others are (like) me I am also more compassionate with others. 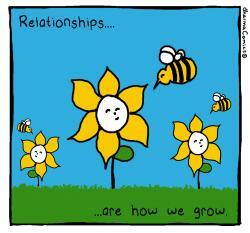 Personal relationships are the real "labs" of growth - where the talk meets the walk. And if we are able to remove the criteria of "happiness" that is so deeply embedded in an 'ideal' relationships, there is a sense of relief. I have been learning a lot about me by my relationships with others. The other becomes a mirror for me to see my true and original self. My transactions with significant people in my life make me see those parts of myself that I unconsciously hide from me. They create a larger space within me to look at me, hear me, show my limitations and help me go beyond the self limiting boundaries I have unconsciously created in me.It has not been always easy to acknowledge and accept my shortcomings. Such a journey is an ongoing process for me. I am grateful to people in my life for removing my blindfolds.